During the six month design and development process, Laura worked closely with the craftsman at our Georgia atelier to come up with four colors that express the range of personality and needs for Laura’s clients. “I was looking for something my clients would gravitate toward,” she said. “We work most often with young families, young professionals, and empty nesters that love to entertain their grandchildren. They don’t want to worry about the kids being careful. “Young professionals who love to entertain just don’t want to worry about maintenance. They know if they choose marble that it will be beautiful but that they’re committing to a maintenance schedule. 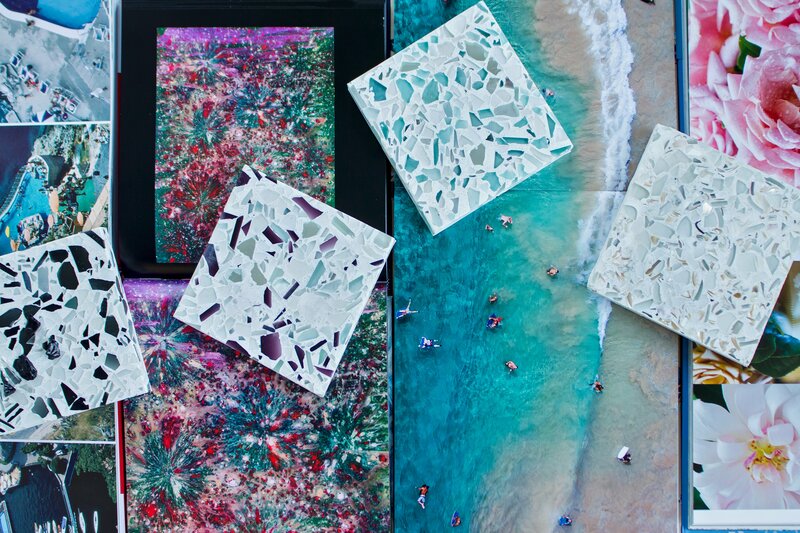 From left to right, the Vetrazzo By Laura U Classically Current recycled glass product line is Classic Black, Orchid Reflection, Aqua Current and Fair Pearl. 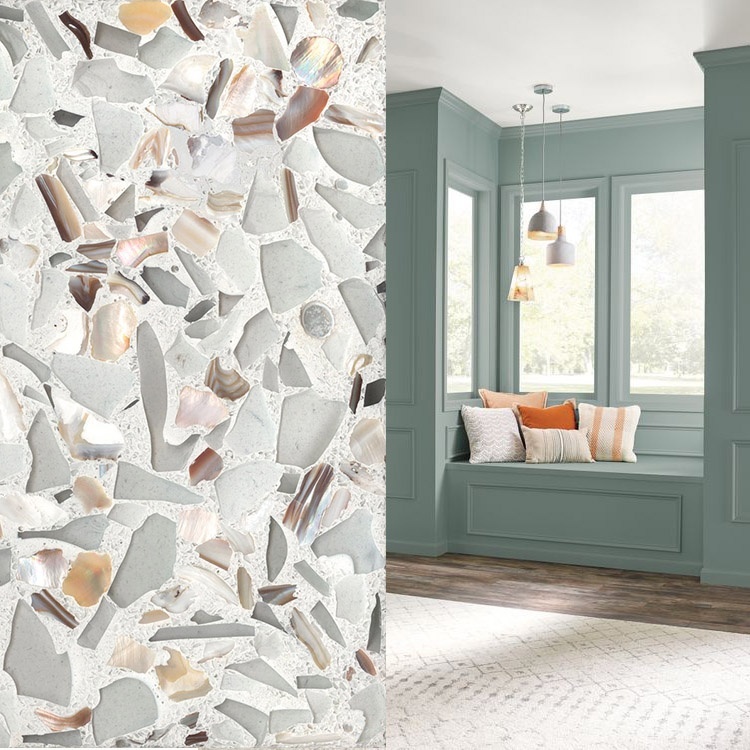 The Vetrazzo By Laura U line includes mixes of aqua, black and white, purple and a pearlescent neutral shade, Fair Pearl, which was the jumping off point for the collection. A crisp white background runs through all four. 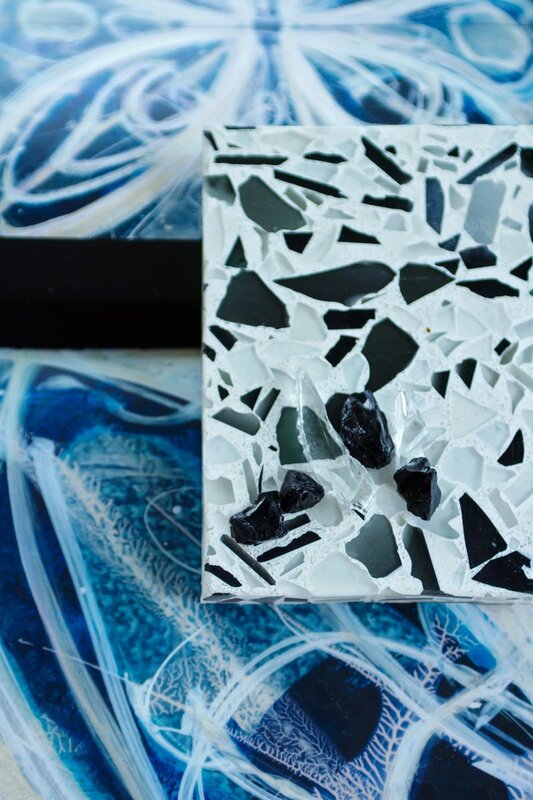 The Laura U line is part of Vetrazzo’s Designer Collection, which is made with bio-resin instead of concrete. The ultra durable resin allows for diverse applications like thin counters and tiles. All the Designer Collection colors are non-porous, stain resistant and never need a sealer - ideal for busy kitchens and high-traffic floors.  “With Vetrazzo you never have to worry about setting down your cup of coffee in the morning or your glass of wine in the evening and, Did I seal it this year? I don’t know. Doesn’t matter this product is ready to go,” Laura said. 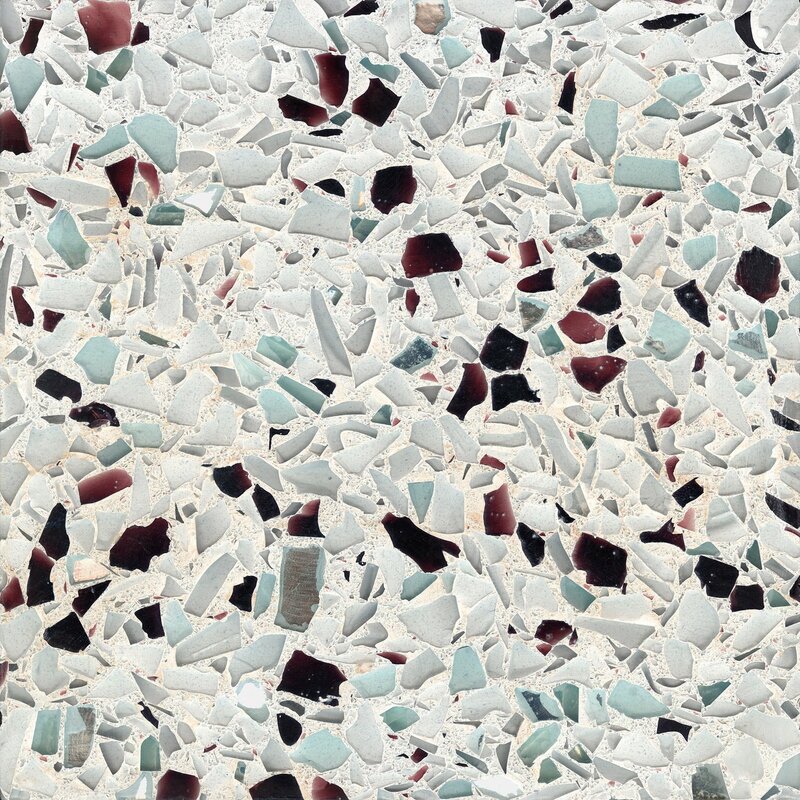 The recycled glass surfaces are also made to measure and can be used for anything from countertops to large-format floor tiles, even pulls and knobs in traditional and modern styles. 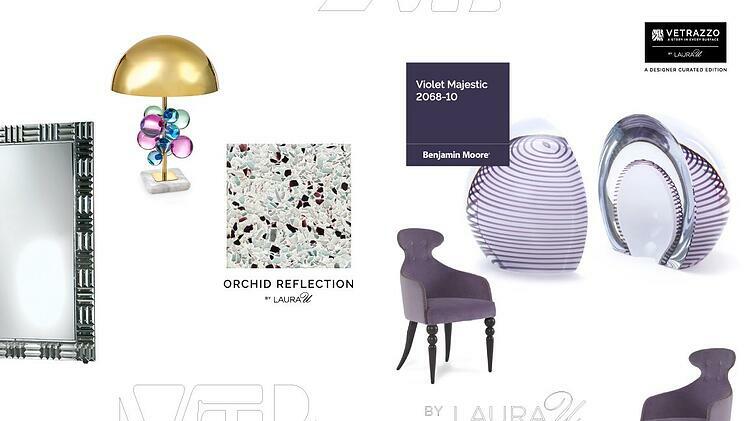 Let’s hear from Laura about the inspiration for each color in her Vetrazzo By Laura U product line. Fair Pearl is my favorite. It’s so soft and feminine. It’s just so pretty. I think you can use it everywhere, a fireplace surround, a full wall, kitchen countertops, a powder room. It’s such an elegant mix of materials. And the blush is so on trend. 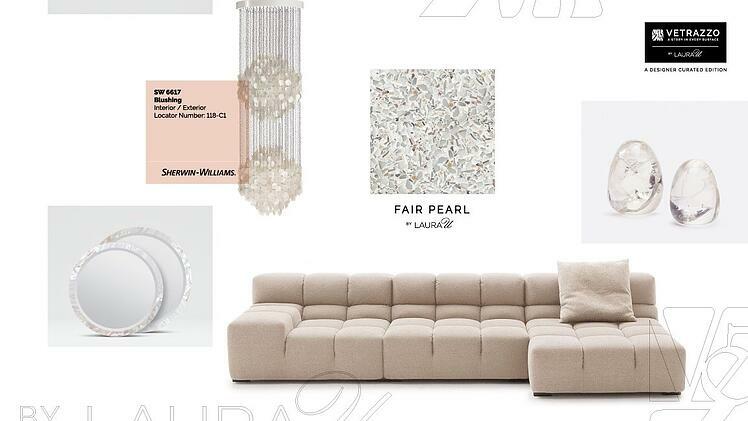 See more Fair Pearl inside Laura U’s home kitchen. 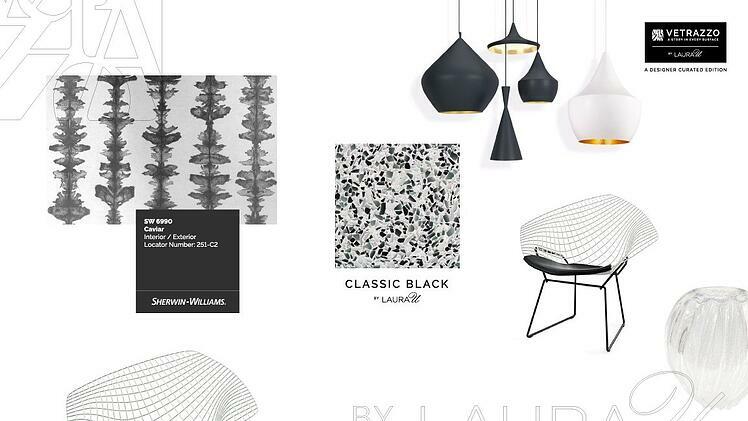 Download the Laura U Lookbook. 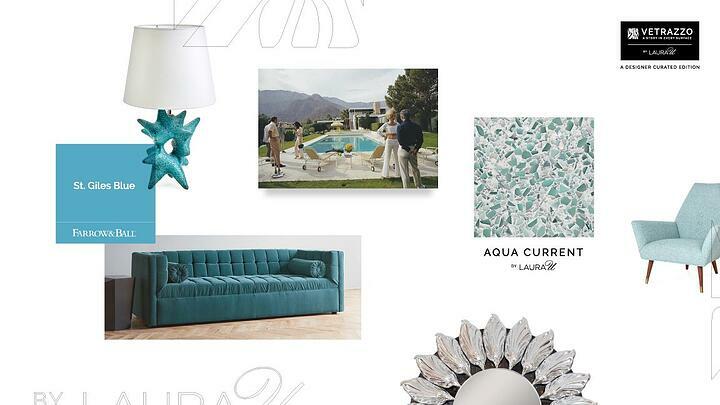 A lot of my client’s projects are destination homes and the homeowners are looking for a relaxed, beachy feel.The Aqua Current has the tones and the movement of the water around them. 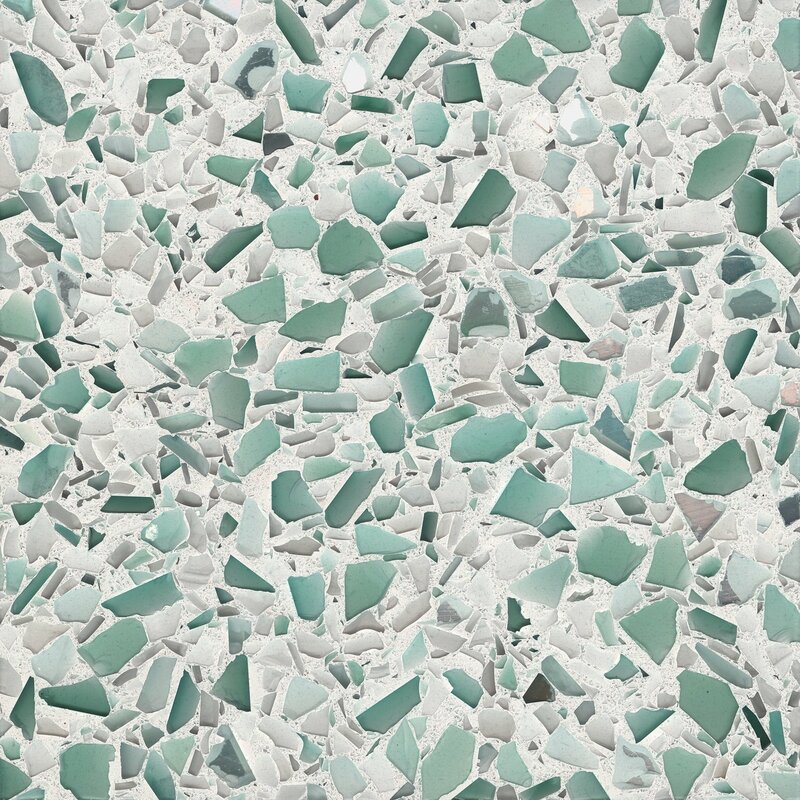 I chose a larger-scale aggregate for the main bold color and smaller pieces of glass and bits of reflective glass for the supporting neutrals, which set it apart from Floating Blue - another aqua-themed Vetrazzo color. When I see this I think, you’re in the kitchen and you’re making a cocktail while looking out to your fabulous pool and landscape. Maybe you’re in Palm Springs, entertaining your friends at your own home with glass doors all around. 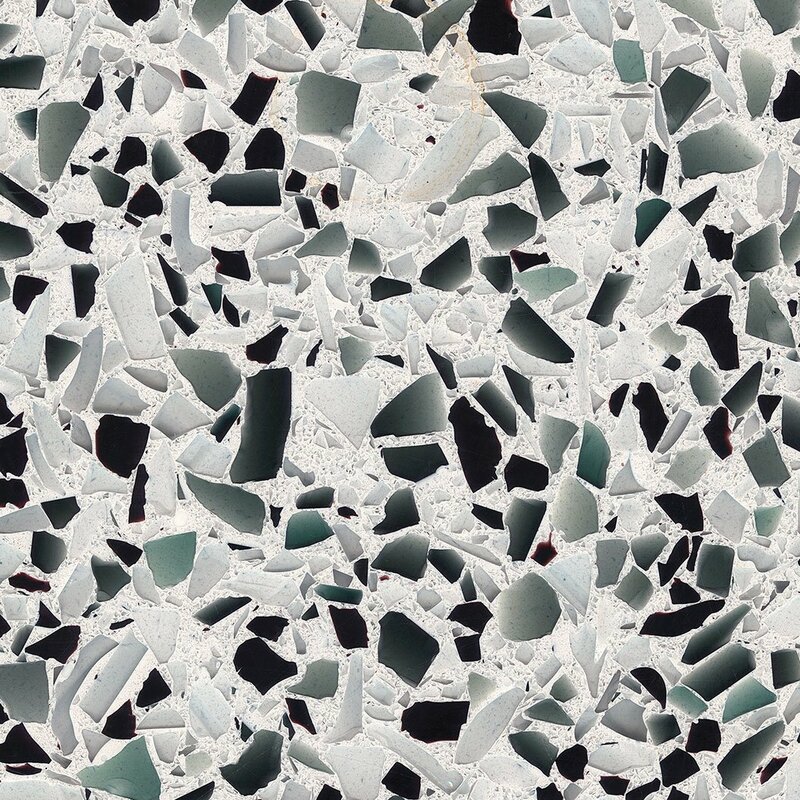 The contrasting black and white glass in Classic Black is a new look for Vetrazzo and it gives it a classic Hollywood glamour feel. I think it’s perfect for entertaining spaces, a bar, a bathroom your guests use and even furniture. When we were in the design process, we originally worked in darker grey glass pieces and then decided we liked the contrast of the black and white better and toned down the grey content. Classic Black is probably the most contemporary of the line and, when we have contemporary elements, we like to balance the hard lines with abstract elements. Our designs are a mix of styles. Here you see the chair is contemporary and pendants are mid-century, the glass is glam and the abstract wallpaper is current and soft. 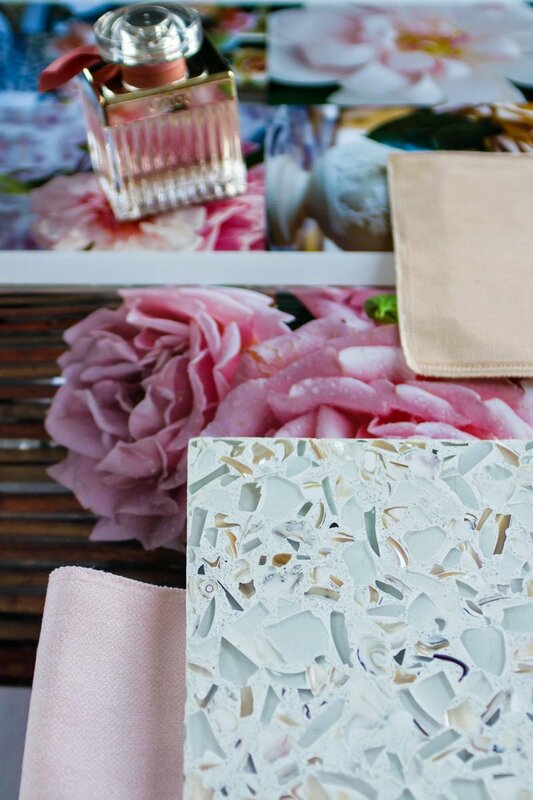 Vetrazzo materials span all different styles. In Orchid Reflection, we played with scale. 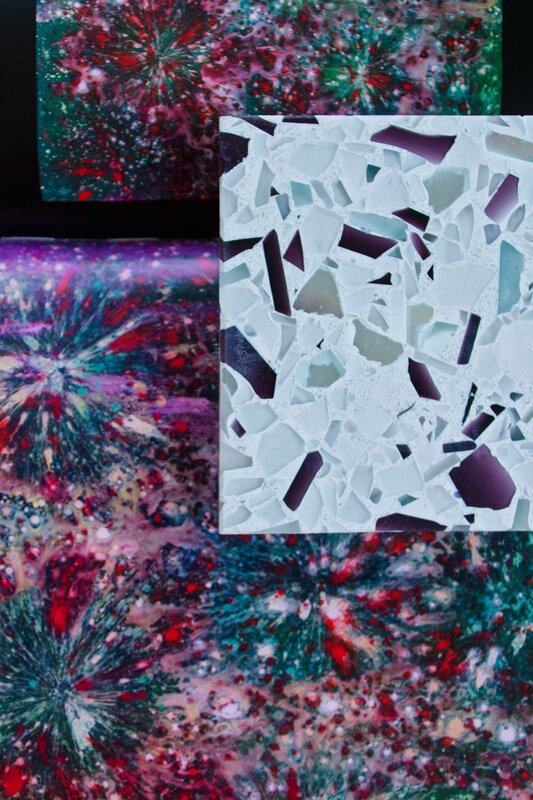 Vetrazzo can control the size of its glass aggregate for large or small doses of color so we went larger with our purple tones. Next, we added bits of reflective glass, which Vetrazzo has never done before. Purple is a really useful color. Even though it’s not a neutral, it’s very versatile and works really well with other colors. Deep plum is especially sophisticated. Aubergine is a really flattering color for a lot of people. Women are attracted to it and it reads a little more masculine so men like it as well. You can even use it in the kids’ room because it’s a fun, unexpected color. When I designed this I was envisioning a desert landscape with its unexpected florals. You know how the flowers look in California? Almost prehistoric. It’s like you’re on another planet - with this injection of color out of the arid ground. 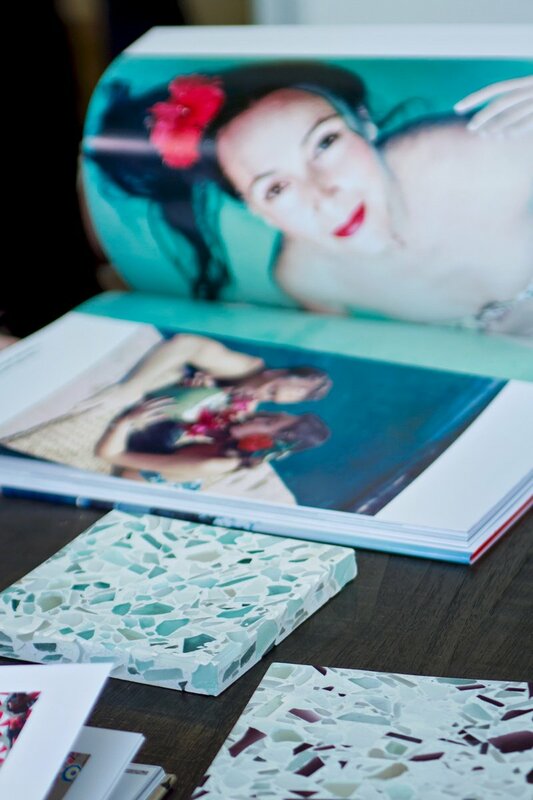 Members of the trade can get a sample of the Vetrazzo By Laura U product line. Click here to order yours.